Superhero sci-fi drama "Krrish 3" is flying high at the box office with both multiplexes and single screen theatres getting overwhelming footfalls on the opening day Friday across the country. The Hrithik Roshan-starrer will be a blockbuster, predict experts. 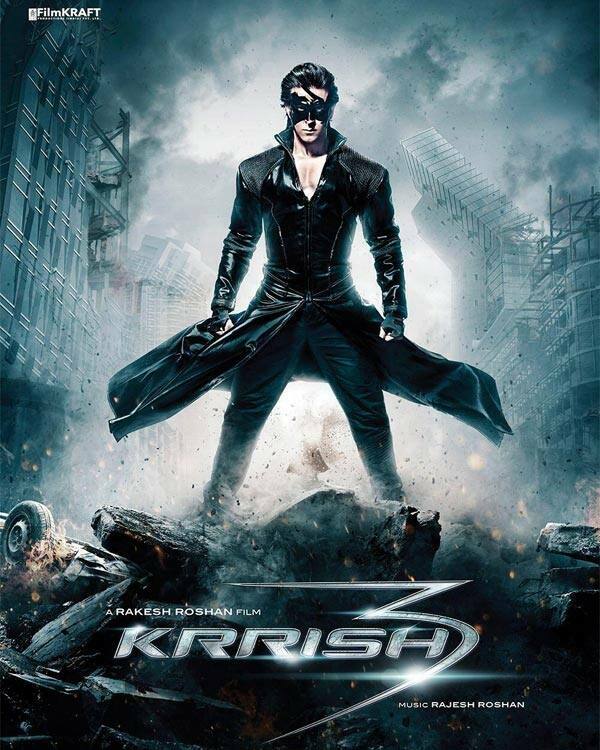 Released Friday, "Krrish 3" is equipped with a spectacular range of special effects and extravagant action sequences. Hrithik returns as the superhero with the film that is the third instalment in the franchise that began with "Koi... Mil Gaya" in 2003. Deepak Sharma, COO of PVR Pictures, says that the film has got "great opening and it's going to be a blockbuster". "The advance booking is as good as it was for 'Chennai Express' and opened like that all across India. Once holiday starts it will do amazing business. It can be in the league of Rs.200 crore. Going by morning show, it's looking good," Sharma told IANS. Vivek Oberoi plays Kaal, the villain, in the movie directed and produced by Rakesh Roshan. It also features Kangana Ranaut and Priyanka Chopra. Reportedly made on a budget of about Rs.100-Rs.150 crore, "Krrish 3" hit approximately 3,500 screens Friday, said a source. Red Chillies VFX, a subdivision of Shah Rukh's motion picture production banner Red Chillies Entertainment, worked on the special effects worth Rs.26 crore for "Krrish 3". Apart from the metro cities, the movie got an overwhelming response to the morning shows in Uttar Pradesh and Rajasthan too, said trade analyst Taran Adarsh tweeted. "The pre-Diwali period is always considered dull by the industry. But a film like 'Krrish 3' can change the mindset," Taran tweeted. Another trade pundit Komal Nahta posted similar opinion on the microblogging site. "'Krrish 3' opening in Bihar circuit crazy. Most cinemas report, all shows full in advance. Such madness rarely seen. And this is pre-Diwali!," posted Nahta. R.K. Mehrotra, general manager, Delite cinemas, said that on the first day mostly children accompanied by their parents came to watch the film. "The opening was extraordinary. It’s housefull till Wednesday. Kids were seen applauding while watching it. The special effects and action sequences are wonderful. ‘Krrish’ is at par with Hollywood films,” said Mehrotra. "Krrish 3" has hit about 700 screens down south and trade analyst Trinath said "Krrish" did good business in Tamil Nadu when it released in 2006. "It was an instant hit in the state, collecting approximately Rs.1.2 crore in first two weeks. It was huge for a Hindi film and it was received very well. 'Krrish 3' was approximately released in about 700 screens in the south," Trinath said. "In Andhra Pradesh, since there are no Diwali releases, the film released in over 300 screens. Despite mixed reviews from critics, audiences are watching it because it's the only big theatre in cinemas this weekend," he added. 'Krrish 3' is a superhero film. It is also a throwback to the creaky family entertainers Bollywood used to make. The hero has special powers, sure, but also a loving daddy, a lovely wifey, an attractive moll and a villain with severe daddy issues. Only a pet poodle or parrot is missing. Superheroes have been around in Hindi cinema for decades, but huge technology jumps have made 'Krrish 3' the slickest of them all, special effects-wise. The rest of it is marred by tackiness. When Krrish is doing his derring-do stunts, we watch, even if we've seen Superman do this 30 years ago. But when he delivers maudlin dialogue about fathers and mothers and bravery, we are pulled back to the ground with a thud, with the superhero the Roshans made. Hrithik is the perfect choice amongst the Bollywood superstar lot to do this role. With his superbly articulated chest, each muscle moving and shiny and oiled, Krrish doesn't even need a mask and a cape. But the ensemble is eye-catching, and we ignore his immaculately-styled long hair, flying in the wind, when he is whizzing about rescuing little boys. Roshan Jr is as likeable and earnest as he usually is, but can't rise above the mothballed treatment. Roshan Sr, who has written and directed, should have given the superhero more to do. But he gets stuck in bringing the backstory forward. The soppy but sweet `Koi Mil Gaya's ( 2003) socially challenged but brilliant Rohit begets Krishna, who finds his super-powers in 'Krrish' ( 2006). Both the ageing Rohit and Krishna star in `'Krrish 3', and both roles are played by Hrithik. Priyanka, playing Krishna's TV reporter wife, has to look on admiringly as Hrithik does his standard dance number. He is still as dextrous, but the dancing has no zing, and the songs are terrible. All is hunky dory, with Krrish doing his superhero stuff, rescuing a damaged aircraft ( there are no seat belts around the screaming passengers : should we care, or does anything go if it is a superhero film? ). And then Kaal ( Oberoi, kitted out in pale pancake and snarls), with the help of his coldly beautiful creation Kaya ( Ranaut, fancy-plaited and slitty-eyed) and a few other `human-aliens', rears up in his den in some snowy mountains in an unspecified spot. And begins his plans of decimating the human race. The team should be appreciated for the efforts taken, I would say a great step forward, people who say the movie is real bad says that because all these sci-fi films directly get compared with high budget hollywood movies. All the graphics of Krrish 3 are home gown and have done a pretty decent job.